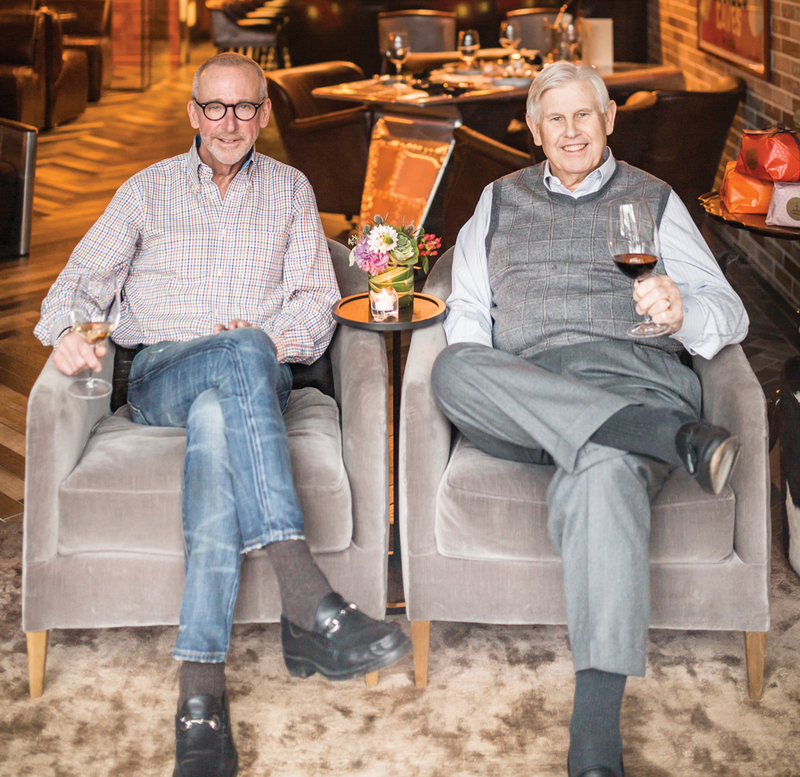 The thought of opening a cozy wine bar offering just a few small plates had been in the back of Charlie Brown’s mind for “four or five years,” the Grosse Pointe entrepreneur says, as he glances around his Cellar 313 much like a proud father. The 32-seat spot named for the local area code, was put together by Brown and business partner, Joe Tompkins, when the former two-story law office became available in 2015. The partners had each recently retired from the automotive manufacturing business and were looking for a second career. They snapped up the building but then took their time with the planning. The results of a year and a half of work show it. In Brown’s words, “we tore it up,” and redesigned it from floor to ceiling. 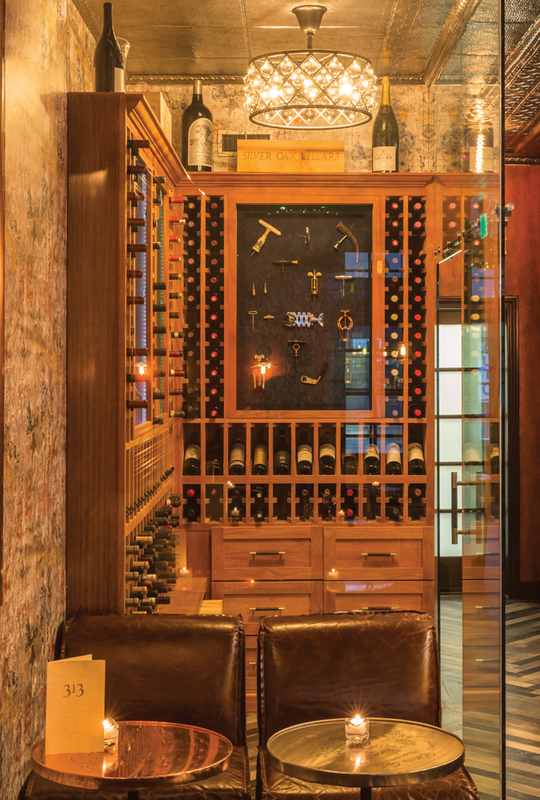 Details include the glass-enclosed wine room that features a collection of antique corkscrews and the gleaming new tin ceiling above. They traveled to the Chicago showroom of Restoration Hardware to choose the sophisticated furnishings, like the sleek antique leather armchairs pulled up to copper-topped cocktail tables, the large framed mirror opposite the bar, and the tile floor that mimics wood in a herringbone pattern. Vintage Edison bulbs offer soft lighting. Brown is the hands-on partner who put together the premium wine list, which includes primarily French, Italian, and American wines with a few from Germany, Spain, South America, and New Zealand. It’s a well-curated list with virtually none of the usual suspects. Brown credits wine distributor Chip Delsener from AHD Vintners with helpful input. About 20 wines are available by the glass. “Not much beer,” admits the proprietor, but cocktails, including a house original — the 313, made with bourbon, spiced pear liqueur, Luxardo maraschino, and torched orange zest — are available along a nice selection of bourbon, scotch, and rye. 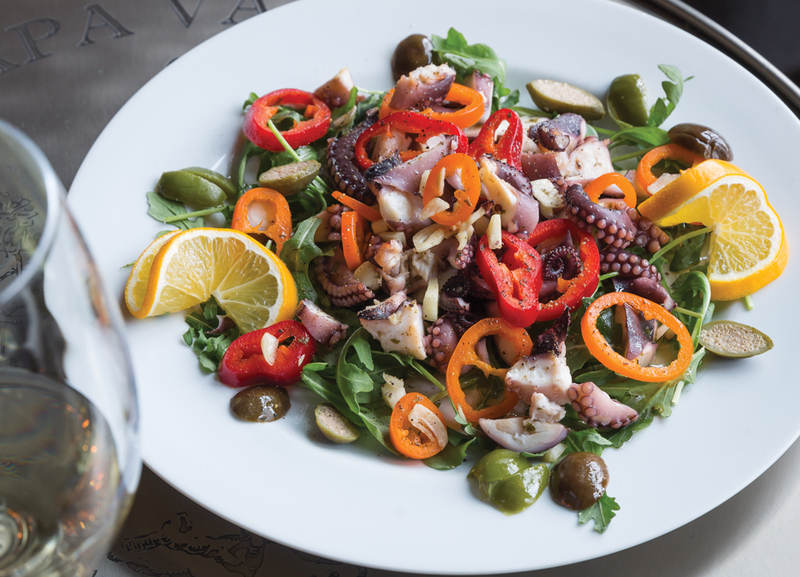 Small plates include a cheese and charcuterie plate, smoked salmon, and an octopus salad. The offerings will vary from time to time, as will the wine list. Cellar 313 is among a strip of shops and restaurants in the part of Grosse Pointe Park that once was known as “the Cabbage Patch.” That slightly derogatory description is definitely outdated. “I’d like to change it to ‘West End,’ ” says Brown. 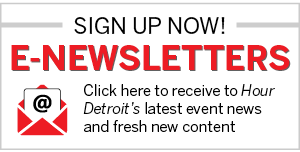 15112 Kercheval Ave., Grosse Pointe Park; 313-458-8544. Mon.- Thurs 4 p.m.-10 p.m., Fri.- Sat. 4 p.m.-midnight.